cpxt9 Enter the letters as they are shown in the image . 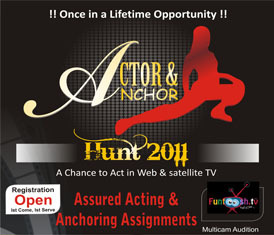 Tollywoodhunts.com is a public web portal owned & operated by AVS WEBS PVT. LTD. with free access and AVS WEBS assumes no liability for the genuineness and quality of response(s)/vacancy(s)/audition(s). AVS WEBS cannot monitor the responses that a person may receive in response to information he/she has displayed on the site. The individual/company would have to conduct its own background checks on the bonafide nature of all vacancy(s)/audition(s)/response(s). AVS WEBS will not be liable on account of any inaccuracy of information on this web site.